Tropical Cyclone Debbie hit the east coast of Far North Queensland (QLD) on Tuesday the 28thof March 2017. It was the second most damaging storm in Australia’s history (more info here). 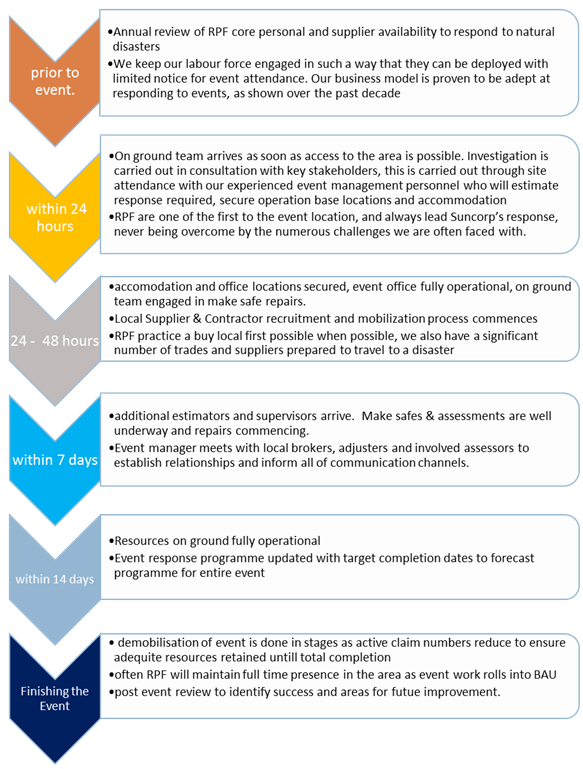 Cyclone Debbie is a great case study to show how RPF Building is able to rapidly respond during an emergency event. Cyclone Debbie caused an estimated $2.4 billion dollars worth of damage across Far North Queensland (QLD) and Northern New South Wales (NSW). Locations such as Hamilton Island, Airlie Beach, Bowen, and Proserpine were devastated and in the worse affected areas people were without access to power and other major services for up to eight weeks. Subsiding flood waters restricted physical asses to for the initial two weeks. Unfortunately, this is a common reality when disaster strikes. These conditions make the task of responding by the emergency services and repair teams incredibly challenging. However, being able to rapidly respond during challenging times is exactly what we do best and it is our 10 plus years of experience and robust processes that are key in our ability to do this. Our information management systems allow for all processes and steps being completed to be recorded, providing all stakeholders with instant and current information on the status and progress of their claim. Our planning and preparation process give us a competitive edge as they ensure we hit the ground running. We are in the affected areas and have commenced coordinating repairs whilst our competitors initiating their response planning and trying to gain physical access to the areas affected. RPF Buildings successful response to Cyclone Debbie resulted in over 1300 claims received from Insurers. Our team, to date, has completed assessments on over $60,000,000 worth of damage. $40,000,000 of these assessments have been approved. Of these approved claims over $35,000,000 worth of repairs are completed with homes returned to their pre-loss condition and resulting in many very happy and satisfied customers. There have been many success stories arise as a result of both RPF’ and the Insurers quick response to the disaster. The following links are to local news stories on Suncorp claims that have had repairs completed by RPF building. These articles demonstrate the positive experience a well-organised builder can provide to Suncorp’s customers through the activation of an effective response plan and a highly skilled and competent team of employees. Whilst our response to the event is a success, at RPF we are always looking to improve what we do and continually review and build on past experiences. We are currently placing a heavy focus around improving transparency between the builder and all stakeholders through implementing upgraded communication channels, and enhancing the exchange of information.